bauma 2019 commences at Munich, bigger, heavier, higher. From April 8 to 14, bauma 2019, the world’s leading trade fair for construction machinery, building material machines, mining machines, construction vehicles and construction equipment, transforms the exhibition grounds in Munich into a paradise for construction machinery fans. The world’s largest trade fair is spread over a 614,000 sq m of exhibition space. bauma 2019 is larger than the smallest town in Germany: Arnis in Schleswig-Holstein (450,000 sq m). The area occupied by bauma is about three times that of the Allianz Arena in Munich. About 600,000 visitors are expected to come from more than 200 countries – this is more more countries than the UN member states. During the construction and dismantling of bauma, more than 13,000 trucks and more than 600 heavyweight vehicles travel to and from the exhibition grounds. If they were to form a chain, it would stretch from Munich to Nuremberg. bauma is the only trade fair for which Messe München rents surrounding areas; 5,500 m of extra fencing are required to fence off these areas. If all the outdoor booths were stacked on top of each other, you would have a building with 481 floors and an overall height of 1,500 m. To put this in perspective: The world’s highest building, the Burj Khalifa skyscraper in Dubai, is just 828-m-high. The world's largest trade fair is even larger this year. It has two new halls and more open space. Says Klaus Dittrich, CEO, Messe München, "The construction machinery industry around the world is very, very healthy. Despite all the economic challenges we are now seeing, with BREXIT and a trade war between the US and China, the industry is confident and is also approaching bauma 2019 with great confidence." Despite the positive prospects, the construction machinery industry faces major challenges. The most important topics are, above all, shortage of skilled labour and digitisation. Says Ralf Lüddemann, Chairman of the Central Association of the German Construction Industry e.V., "The problems of digitisation and shortage of skilled labour parallel. They can’t be separated from each other. We simply address the shortage of skilled workers by trying to invest in training, because in the course of digitisation, our employees’ working environments are also changing. And, of course, we also have to take the employees with us in these changed working conditions." Given that, the state of digitisation is quite diverse. A recent study by Messe München found that only 4 per cent of respondents say they are among the frontrunners. Nevertheless, around 20 per cent do not see any need for action at the moment. Adds Franz-Josef Paus, Chairman of FB Construction Machinery in the VDMA, "The big challenge now is, to make the products smarter. And, to use intelligence where it makes sense, also on all platforms, via all manufacturers, so the productivity on the construction sites, of our customers increases. Because it is no use to a contractor if three out of 10 of their machines are connected and the other seven are not. Manufacturers and users will be expecting solutions to these challenges at bauma 2019." For Klaus Dittrich, CEO, Messe München, "I believe the message coming from bauma will be: Digitisation is the future of this industry." The absolute heavyweight of all the exhibits is Liebherr’s LR 1800 crawler crane. It weighs 1,070 tonne, which corresponds to the weight of 25 airplanes. It required 42 individual transports. Second place in terms of weight is Komatsu’s hydraulic excavator PC 4000, which weighs 400 tonne. It is about the same size as a detached house. In the “smallest” category, the electric compact excavator E10e from Doosan-Bobcat takes the lead: The first mini-excavator in the 1-tonne class is just 71 centimeters wide and can fit through a standard front door of a house. The exhibitors with the largest areas are Liebherr, with 14,401 sq m, the Wirtgen Group, with 12,960 sq m, and Caterpillar, with 11,237 sq m. The area taken up by the top 3 corresponds to more than five soccer fields. The Wacker Neuson Group also has the most noticeable visitor attraction: a Ferris wheel. In 24 cars, four to six people can enjoy the view from a height of 40 m for free. 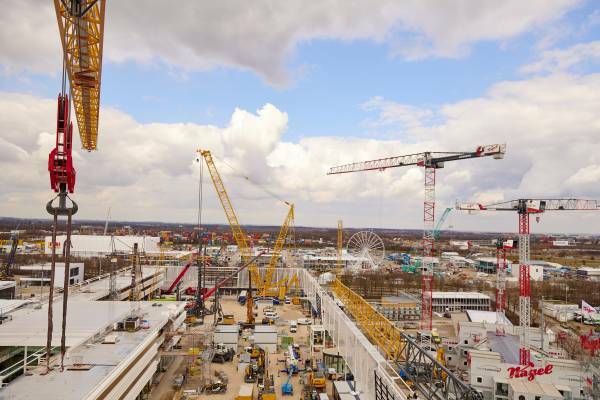 This means that Munich will have two Ferris wheels at the same time in April: Four days after bauma, the Hi-Sky observation wheel will be opened in the Werksviertel district.